Alan Kefauver likes to go fast. 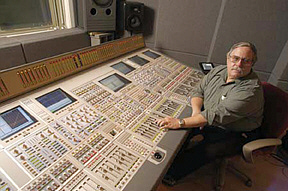 The director of the recording arts program at Peabody Conservatory has always preferred sporty cars for his daily driving: a Cobra, an Alfa, a 1968 Volvo P-1800S. But about three years ago, he decided to take his passion for speed off the road and onto the track. He bought a 1991 Ford Mustang for $1,000 and began rebuilding it as a racecar in his garage. The result is pictured here, car no. 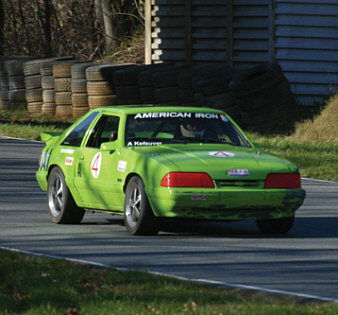 4, racing in the National Auto Sport Association's American Iron series. "My son picked the color," Kefauver says. "He's 14." Kefauver didn't grow up working on cars. "I'm one of those guys who reads a book about something and then has a tendency to do it," he says. "It makes my wife crazy. She never knows what I'm going to do next." He spent several years attending driving schools and qualifying for his competition license before participating in the American Iron series — eight races, held from March through October, on tracks in Virginia, West Virginia, and the Carolinas. "At this point, my goal is to finish the races. The last race I completed, I was in the top eight, but that was because cars nine through 12 didn't finish," he says, adding, "I'm 58, and a lot of these guys are in their 20s. Their reflexes are a lot quicker." Kefauver can reach speeds of 140 mph on the straightaway, then must brake down to 25 for the corners. "The hardest is being consistent and smooth. You have to hit the apex of the turn the same every time." His son Alex, who has attended classes at Hopkins' Center for Talented Youth, helped build the car and accompanies his dad to the races, working as a mechanic. Is Kefauver ever scared? "Oh, yes. When an accident happens in front of you at 100 miles per hour, you're on it real quick. You have to train yourself to react but not panic, and do the right thing."